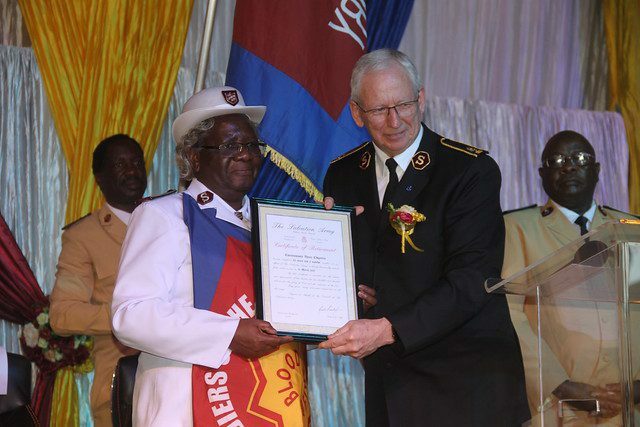 Leading the retirement meeting for Commissioner Vinece Chigariro, General Brian Peddle challenged Salvationists from the Zimbabwe and Botswana Territory to be people of prayer and holiness—attributes that were demonstrated in the life of the commissioner. Chigariro entered retirement March 31, having served for 43 years and seven months. At the time of her retirement she was the international Salvation Army’s “senior commissioner,” the officer to have served longest as a commissioner. 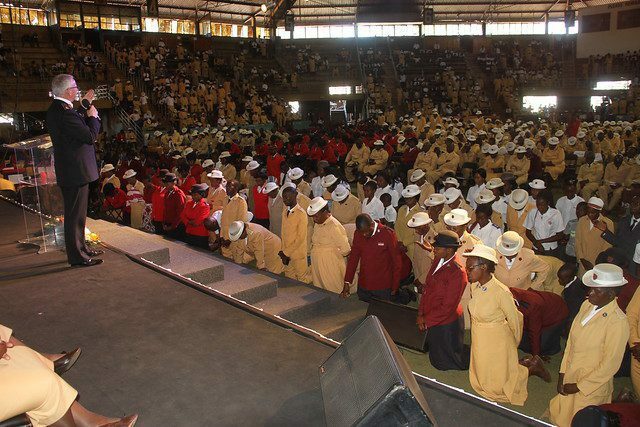 The five-hour meeting was attended by thousands of Salvationists and friends from Zimbabwe, including territorial leaders Commissioners Joash and Florence Malabi, along with representatives from Zambia, Uganda and the SALT (Salvation Army Leadership Training) College of Africa. The General paid tribute to Chigariro’s faithful service in her home country of Zimbabwe and in Tanzania, Zambia, Kenya and Uganda—where she concluded her active officership. He described her as a woman of faith, conviction, determination and resilience, and a blessing to many. Having presented the commissioner with her retirement certificate, the General called on the congregation to be faithful to God who will in turn, he assured them, be faithful. He encouraged all listening to learn from Chigariro’s faithfulness to God. He offered a thanksgiving prayer to God for the service of Chigariro as she knelt at the mercy seat. Various speakers commended Chigariro for visionary leadership and the desire to see the Army grow. The meeting was a fitting occasion for the General to express words of comfort to Zimbabweans in the midst of the devastating Cyclone Idai. He encouraged the people gathered to take refuge in God as their strength and fortress, even during natural disasters and socio-economic challenges.